﻿ Casa De Leela Self Catering Bungalows & Apartments, Seychelles Islands | FROM $127 - SAVE ON AGODA! "Centrally located in the island it was a great base for expl..."
Have a question for Casa De Leela Self Catering Bungalows & Apartments? "of this good accommodation we were able to sleep very well and get the enregy to visit every nook and cranny on this beautiful little island." 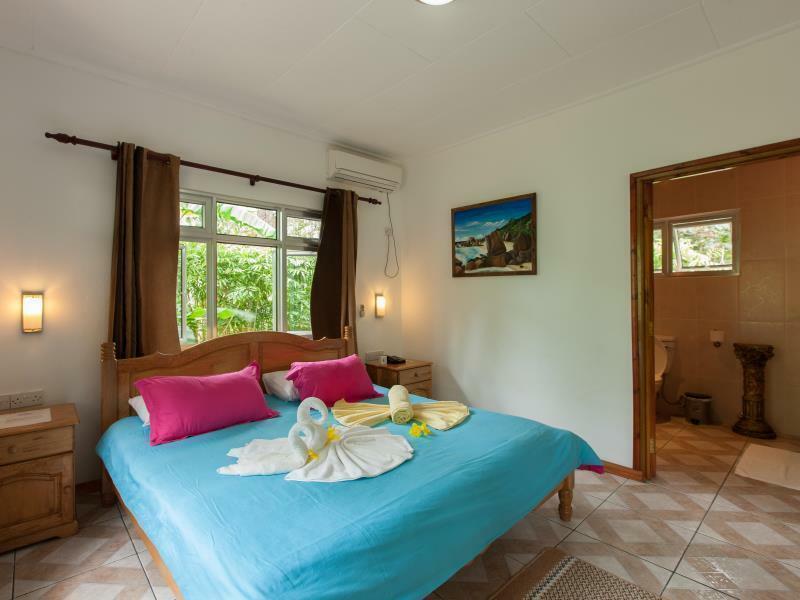 "We enjoyed the beauty of our surroundings more than the perf..."
When visiting Seychelles Islands, you'll feel right at home at Casa De Leela Self Catering Bungalows & Apartments, which offers quality accommodation and great service. The hotel is not too far from the city center: just away, and it normally takes about minutes to reach the airport. 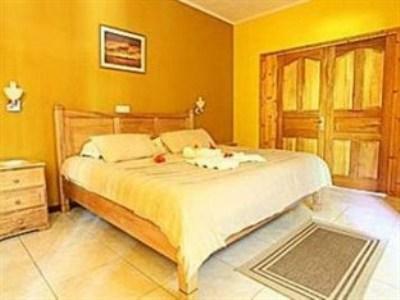 For sightseeing options and local attractions, one need not look far as the hotel enjoys close proximity to Azzura Pro-Dive, Veuve Reserve Information Centre, Horse-Riding. Take advantage of a wealth of unrivaled services and amenities at this Seychelles Islands hotel. Top features of the hotel include daily housekeeping, taxi service, kitchen, luggage storage, Wi-Fi in public areas. Step into one of 3 inviting rooms and escape the stresses of the day with a wide range of amenities such as television LCD/plasma screen, air conditioning, mini bar, balcony/terrace, telephone which can be found in some rooms. The hotel's outdoor pool, garden are ideal places to relax and unwind after a busy day. With an ideal location and facilities to match, Casa De Leela Self Catering Bungalows & Apartments hits the spot in many ways. 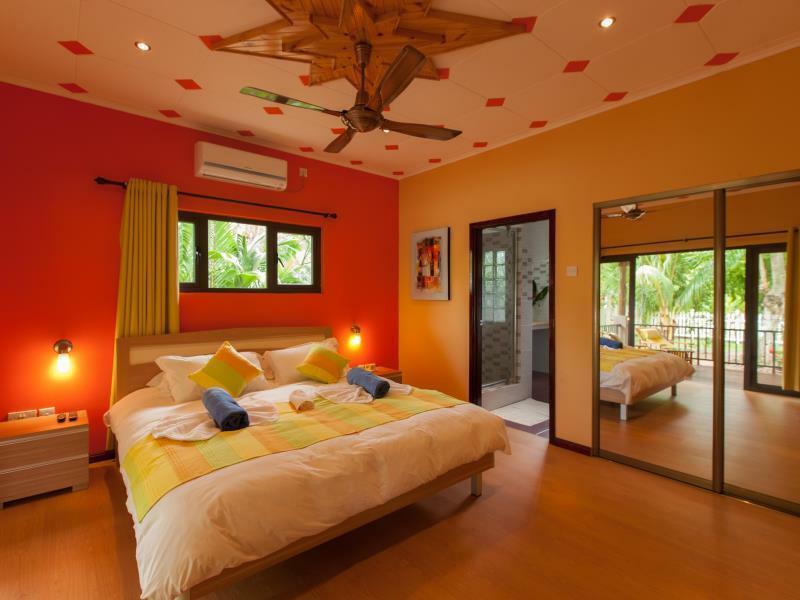 "The staff were very friendly and helpful and were more than..."
My husband and I stayed in Casa de Leela as our second stop on our honeymoon and it was a great location for our stay on La Digue. Centrally located in the island it was a great base for exploring. We rented bikes from reception which were pretty good. I would recommend renting a bike as it is the best way to see everything. The villa we stayed in was well equipped and clean with beach towels changed as often as needed. The air conditioning worked well although it was a little loud at night, nothing earplugs can’t handle. We paid a small fee for wifi and it was pretty good as Seychelles wifi goes. The staff were very friendly and helpful and were more than happy to assist in any way we needed. The staff were friendly and the place is nice, but not what we expected. Staff are not always available and there were more ants in the apartment than we've experienced. The location is out of the way, but not unmanageable, just good to be aware it's a 10-15 min walk to the store/beach, etc. My husband and I do not join tour groups and this allows us to make plans spontaneously. When we arrived on La Digue we stayed in Cabanes des Anges for four days. Our self-catering unit with a bedroom, living room and kitchen and terrace was immaculate. The kitchen was modernly equipped and the staff was very helpful. We liked La Digue so much that we decided to return for the last three days of our stay on the Seychelles. Cabanes des Anges was booked out except for a small overpriced accommodation. Casa De Leela offered us a very reasonably priced apartment which had more space. What was missing at Cabanes des Anges was present here. 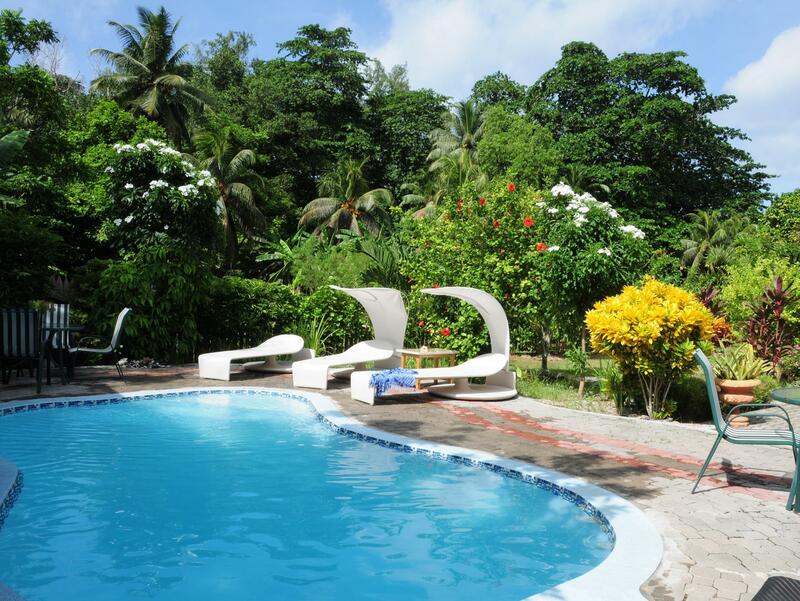 This accommodation is located in a mini tropical park with coconut trees, local birds and native fauna. This is a place for nature lovers. Ants, mosquitoes and a vintage refrigerator did not bother us. We enjoyed the beauty of our surroundings more than the perfection of our first accommodation, which lacked the tropical paradise.. The manager wasn’t really keen to help us out and the information about the hotel such as breakfast time and location wasn’t provided. The apartment was fully equiped but was full of ants. The Manager was rude and was only intersted in the money. He had no interest in customer satisfaction at all. We would not recommend the accomodation as we felt not welcome at all. 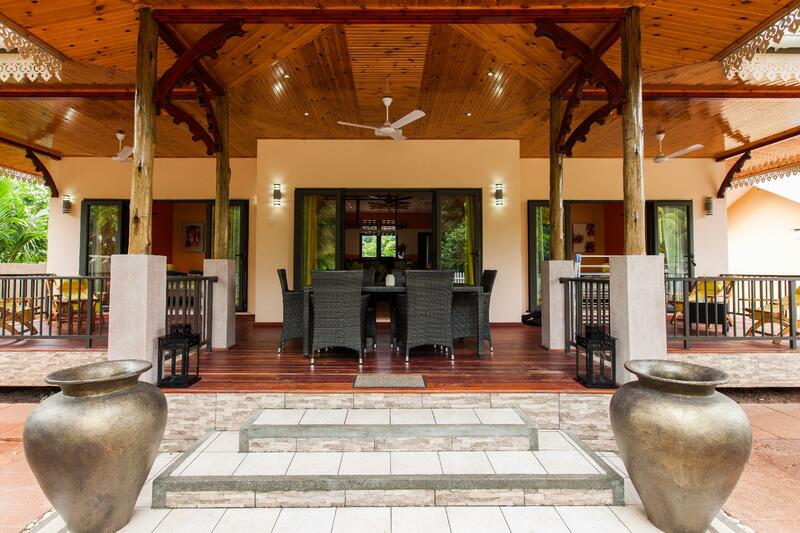 this little bungalow served our purposes nicely for 12 days on la digue. near the reserve we were able to bird watch regularly the fabulous black paradise flycatcher which is only on this island - in the world. A staff member called Shankar from Nepal was particularly friendly and kind and generally everything went smoothly from hiring bikes, to extending our stay, the swimming pool, the quiet colourful gardens with many birds, the nearby Gala takeaway, we would have stayed longer if we could. Because of this good accommodation we were able to sleep very well and get the enregy to visit every nook and cranny on this beautiful little island. Thank you for the staff and team. Virginie at reception was very sweet and helpful - the bikes are a bit old and could be renewed as we think this is a lucrative place where the owners Robert and Charlotte have built a great complex. Had a great stay. I recommend it. Great breakfast. Nice swimming pool specially for the kids. Rent some bikes and its a great place to stay. Can reach the whole isle. Bring some torches, gets dark at night :) Restaurant, shops, even beach are within walking distance. But easier by bike! Been to Mahe, Praslin and La Digue. La Digue is the best island to stay for a longer period of time. ease of biking anywhere, relaxing, not too many cars, really stunning beaches. great snorkeling, and don t forget to do a boat trip while you're there! La casa era preciosa. Tenía todo lo necesario, hasta un vestidor enorme. El único problema es q sólo había wifi en recepción e iba lento. Por lo demás merece la pena. Hemos estado genial y al ser nochevieja nos regalaron una botella de champán. Han sido muy amables. Gracias! Un joli cadre, un appartement spacieux et très bien équipé, le tout très bien situé pour peu qu'on prenne l'option vélo (un classique sur La Digue de toute façon). Seuls tout petits bémols : la piscine est plus petite qu'elle n'y parait sur les photos et le WiFi payant (même si c'est pas cher, c'est agaçant d'avoir à demander et payer à la réception). pas de cafetière contrairement au descriptif. wi fi payant 10 euros pour le sejour. location de vélo sur place plus chere que ce qui est proposé au port. navette payant pour les transfères, alors que nous sommes a 5mn du port...piscine tres petite. pour le prix affiché les prestations ne sont pas a la hauteur. À 600 mètres de la plage, ce petit hôtel (appelé guest house ici) est propre et récent. Facile de loger avec deux petits loulous (dans le même lit) car la chambre est grande. Petite piscine agréable.très bon rapport qualité/prix. Petit déjeuné passable. Bon séjour. Personnel très à l'écoute. Appartement fonctionnel et propre. Location de vélos. Attention ce n'est pas là où s'est indiqué sur le plan d'Agoda mais sur la route le long du parc de la veuve. Donc compliqué de trouver avec un mauvais plan. Équipement qui date, mais propre. Wir waren im Oktober für 5 Tage im Casa de Leela mit zwei Erwachsenen und drei Kindern. Wir hatten eine sehr grosse Wohnung, die Maison d`Amour mit zwei Zimmern, in eines wurde ein Beistellbett gestellt, in der Mitte ein grosses Wohnzimmer mit Küche, draussen auf der Veranda ein Esstisch für sechs Personen. Jedes Schlafzimmer verfügt über ein eigenes Bad mit Dusche, WC und ein eigenes Ankleidezimmer und Klimaanlage. Es gibt einen Safe im Zimmer. Das Personal war immer für uns da. Der Pool ist eher klein, aber sauber, 24h nutzbar und die Kinder hatten ihren Spass. Wir Erwachsenen waren lieber im Meer. Wir hatten Fahrräder gemietet. Diese sind eher verrostet und meist funktionierte nur eine Bremse, aber dies ist bei fast allen Rädern auf dieser Insel so. Bei den Kinderrädern fiel am ersten Tag immer die Kette raus, aber das Personal organisierte sofort jemanden, der die Kette anzog. Sie waren immer sehr freundlich. In der Rezeption gibt es täglich frische Strandtücher. Internet hatten wir für 10€ für den gesamten Aufenthalt. Zum Frühstück ist folgendes zu sagen: es gibt kein Buffet, sondern jeder bekommt erst einen täglich wechselnden Saft, einen Obstteller, dann Pancakes/Porridge (jeden Tag etwas anderes), und dann Toast. Auf Wunsch wurden Eier gebraten. Das Frühstück hat immer sehr lang gedauert, weil hier eher langsam gearbeitet wurde, aber wir waren ja in den Ferien. Insgesamt hat es uns sehr gut gefallen, wir waren etwas im Inselinneren und es war schön ruhig. Wir würden wiederkommen!